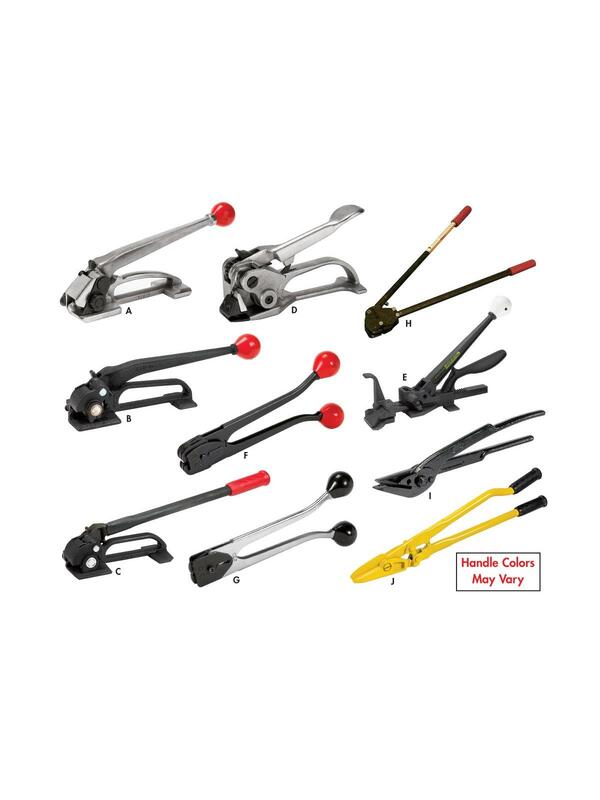 Steel Strapping Tools | The Rembert Company Inc.
A) Heavy Duty Feed Wheel Tensioner - For high tension use. Use for steel 3/8" - 3/4" wide, strapping thickness up to .023". B) Feed Wheel Tensioner - For regular tension. Use for steel up to 3/4" wide, strapping thickness up to .023". C) Heavy Duty Windlass Tensioner - For maximum tension. Use for steel strap 1-1/4" wide, strapping thickness up to .031". D) Pusher Feed Wheel Tensioner - For round surfaces. Use for steel strapping up to 3/4" wide, strapping thickness up to .031". Select width. E) Heavy Duty Rack Tensioner - For round surfaces. Use for steel strapping up to 3/4" wide, strapping thickness up to .031". F) Double-Notch Sealer - For use with open or closed seals. Use for steel strap up to 3/4" wide, strapping thickness up to .025". Select width. G) Single-Notch Sealer - For use with pusher-style seals only. Use for steel strap up to 3/4" wide, strapping thickness up to .025". Select width. H) Heavy Duty Single-Notch Sealer - For round surfaces and for use with heavy duty pusher-style seals only. Use for steel strap up to 1-1/4" wide, strapping thickness from .025" to .029". Select width. I) Steel Strapping Cutter - Cuts steel strap 3/8" to 3/4" wide, strapping thickness up to .031". J) Heavy Duty Steel Strapping Cutter - Cuts steel strap 3/4" to 1-1/4" wide, strapping thickness up to .035". 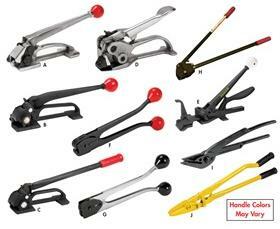 See Related Items tab for Seamless Steel Strapping Tool.